When my family moved to Canada, I went through a period where I would eat Nutella straight from the jar—no bread, just spoonfuls of chocolaty goodness. I probably should mention that I highly regret doing this, as it may have been was [definitely] responsible for my weight gain in my teen years (I now advocate moderation). I needed a little bit of comfort today; studying for my final exams has been horrible. A combination of exhaustion and lacking drive makes it extremely difficult to concentrate. 2. 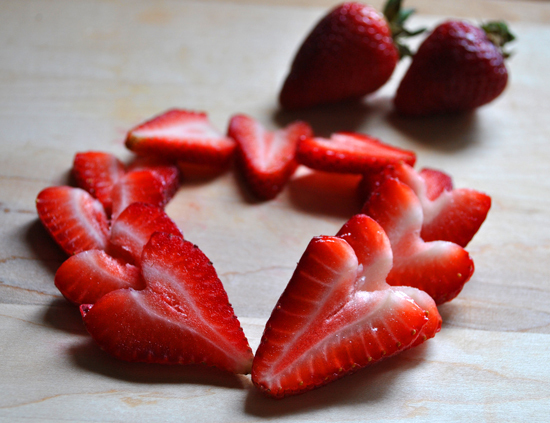 Slice your strawberries while the bread is toasting. You can take a few extra minutes to make them into hearts, but this is completely unnecessary. 3. 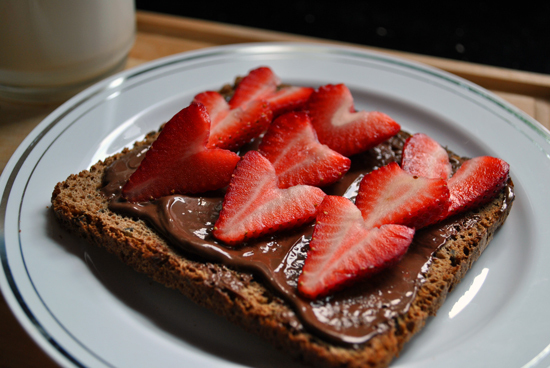 Spread Nutella on your bread while it is warm, and top with sliced strawberries. A simple and satisfying treat for when you’re running short on time and mental capacity. Enjoy. Sounds divine!! I have nutella and strawberries in the house – I think I'll make this today! I didn't discover Nutella until a year or so ago. I can't believe all I was missing out on! thank you for reminding us that it's the simplest things that make our life beautiful! i think that you are such a good writer. i love your blog, too bad that you don't have time to post more often. goodluck on your exams. Strawberry and nutella, why did I not think of that combination earlier! Looks really good.